Cynthia Jane Carey of Watsonville, Ca died on Tuesday, March 26, 2019 in a tragic car accident in Capitola, California. Widely known as “Jane Carey” and “Janie Ryan,” to her family and friends. She was 60 years old. 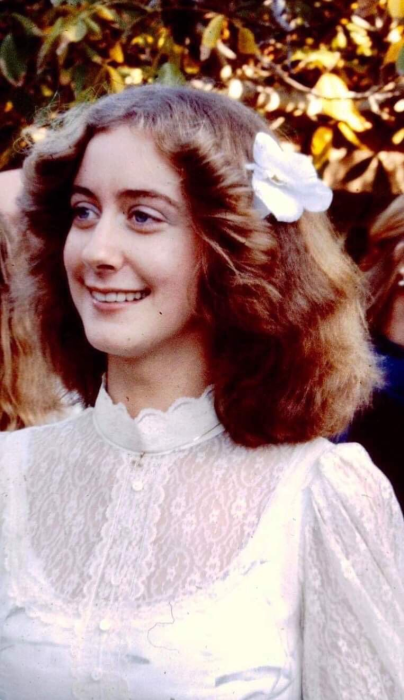 She was born Cynthia Jane Ryan on February 17, 1959 in Saranac Lake, NY to Joan A. Ryan and the late Francis T. Ryan. She was the 4th of 6 children. Janie always enjoyed hiking and the outdoor life that growing up in the Adirondacks afforded. She was a true to heart “mountain girl” and treasured many years of living on Mount Madonna between Gilroy and Watsonville, CA where she spent most of her adult life. Once when working at the Mount Madonna Inn, she was delighted to meet Clint Eastwood who she commented reminded her of her dad in both looks and personality. Janie was a boisterous, energetic, and happy young girl. A fond memory from her youth was when Jane and her siblings took skiing lessons at Mount Pisgah as they were was bussed from St. Bernard’s to the mountain for lessons where they got to use the original “rope tow” and get pulled up the hill. Janie also spent many a carefree day at the William Morris Playground frolicking with her siblings, cousins, and friends. From birth until age 15 Janie lived in Saranac Lake and attended St. Bernard’s Elementary and Saranac Lake Middle School. She was very outgoing and had loving bonds with family and friends who adored her. At 15, Janie moved to Hollister, California with her mom, dad, and younger siblings, where she continued her high school education. Janie was often counseled and mentored by a former priest from Saranac Lake who had also moved out to Hollister and was a friend of the family, Father Thomas Tucker. Janie is survived by her only son, Peter Thomas Ryan who was born on September 6, 1975 in Watsonville, Ca. She was so proud and happy to be Peter’s mother. Janie returned to Saranac Lake numerous times throughout the years but would always gravitate back to the Watsonville area to live. Jane married the late Patrick Carey in January 2000 and lived a quiet and happy ten years in their beautiful home on Bella Vista Lane in Watsonville, Ca. Jane was an avid Gardner and her flowers were something to see. She loved to work outside with her hands. She was also a nature enthusiast besides being a strong hiker; Jane enjoyed many trips to our national parks to explore, camp, and just enjoy being outdoors to take in the beauty. Jane also loved going to opera performances. Jane was pre-deceased by her father Francis T. Ryan and former husband Patrick. She is lovingly survived and remembered by her mother Joan Ryan; son Peter Ryan & fiancé Lisa St. John; her grandsons, Slater Moody, Samuel Cushman, Addis Modest; as well as her five siblings, Shiva Ma Ryan (Jeanne) & partner Dev Ram, Joanne Ryan Terrien & husband Tom, Francis D. Ryan & wife Darlene, Rosemary Ryan Davis & husband Curran, and Daniel T. Ryan & partner Rhonda. Jane will also be fondly remembered by her many aunts, uncles, cousins, nieces, nephews, grandnieces and grandnephews. Visitation hours in Watsonville, Ca will be held from 3 to 9 pm on Sunday April 7, 2019 at Ave Maria Memorial Chapel, 609 Main St., Watsonville, Ca.